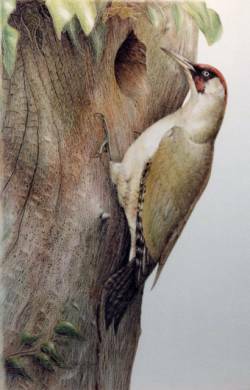 Green Woodpecker by Nicholas Day.Now you can own a signed limited edition print, (only 50 printed), by a successful Wildlife Artist using an original medium.At an affordable price! Image shown,"Woodpecker At Nest Site"in an acid free mount.Size of the print is 12" by 15"(38cm by 30.5cm)This is signed and numbered limited edition of 50 only.Printed to a very high resolution and standard, on superb quality paper with fast inks to guarantee total colour strength for at least 80 years under normal conditions.You will be very impressed with the price and the quality of this mounted print. Fairly common resident over much of England and Wales, especially the southern parts. Scarce and locally distributed in Scotland (which it colonised in the 1940's), and absent from Ireland. Found in woods, farmland, parks and large gardens (where it is often seen feeding on ants in lawns), and heaths and coastal dunes. Distinctive, large woodpecker and the only British species to show green tones. Most noted features are the red cap and often strikingly yellowish rump as the bird flies away. Has a loud, characteristic 'laughing' call. Any one who has ever taught a bird watching class or led groups of beginners will be familiar with the rare birds seen by their group. And sooner or later one of them is bound to report ' a brilliant yellow bird with a bright red head'. And they are usually convinced it is some sort of tropical bird - it must be really rare. But it is a sighting of this bird, which often takes some time to be accepted as 'only' a green woodpecker, which can fire the enthusiasm of many beginners. The yellow is in fact a yellowish green, confined to the rump, which becomes very visible as the woodpecker flies away with its bouncing 'undulating' flight. There is no question, the green woodpecker is one of the most colourful of all the birds native to Britain. And they make themselves very obvious by often feeding right out in the open in the middle of the lawn, where they can be relatively inconspicuous while feeding, but when disturbed become very obvious as they fly away. Unlike the other two species (the Greater and Lesser Spotted Woodpeckers), they are frequently to be seen on the ground, and this is because they have a great love of ants, and will return day after day to a favourite anthill to feed. Like the other woodpeckers, Greens do drum, but their drumming is neither so resonant nor harsh as the other two species, nor as frequent - they rely on their laugh to demarcate their territory. In Europe the closely related, though duller, gray-headed woodpecker is also found - but this is a more difficult bird to find, and one that even keen birders often have trouble in seeing.